Jordan 6 Fusions, a little Nike x Jordan tribute to the 1991 release of the Jordan VI, will be released in early 2009. 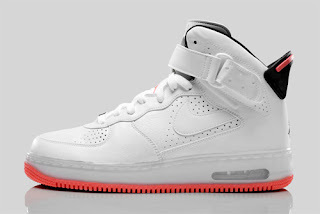 The shoe is a combination of a modified Air Jordan 6 with emphasis on the Air Force 1 bottom. A few different colorways will be released between January and March of 2009 including a Hot Lava. The shoes will retail somewhere in the neighborhood of $135 and $160.